To inject human emotion into metallic circuitry, the drips and drabs of memory and fragments of what others may consider unimportant are what Shyu Ruey-shiann has made a habit of incorporating into his mechanical art. 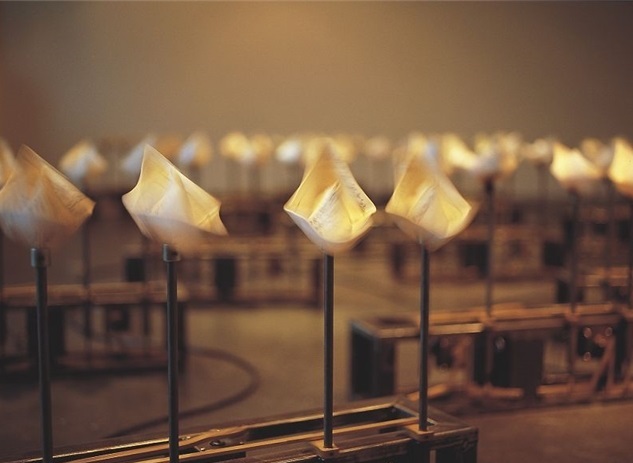 Shyu Ruey-shiann is one of Taiwan's most important pioneers of contemporary mechanical kinetic art. In his first decade of studying art, Shyu mainly focused on traditional Western paintings and sculptures, but in attending the Aix-en-Provence Art College in southern France in 1993, he was introduced to a diversity of creative media, materials, and methods. Of these, steel, machinery, and kinetic art were particularly inspiring, setting him off into the world of mechanical kinetic art. After earning a Diplôme National Supérieur d'Expression Plastique (National Higher Diploma in Visual Expression) degree in 1997, he returned to Taiwan. During his studies in France, Shyu found his time at art school had sparked a renewed dedication to his artistic work thanks to the encouragement to experiment with new media he was receiving. He would spend long hours working away on his new mechanical creations, to the point the school had to close the workshop after hours to prevent him losing himself completely in it. A 2007 documentary by director Huang Ming-chuan (黃明川) paid particular attention to how Shyu removed iron filings with calloused fingers. 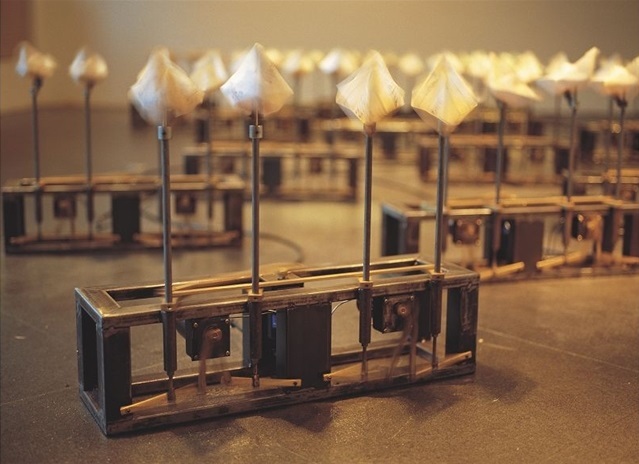 Shyu's early piece "The River of Childhood" (1999) uses boats made of paper atop steel structures to simulate releasing small boats into the river as a child, simultaneously reflecting on a deeper level the changes that Taipei's Xinyi district has undergone. He grew up in that district during a time when it was all rice paddy fields, and so through this work he took a sideways approach to discussing how the area had transformed. 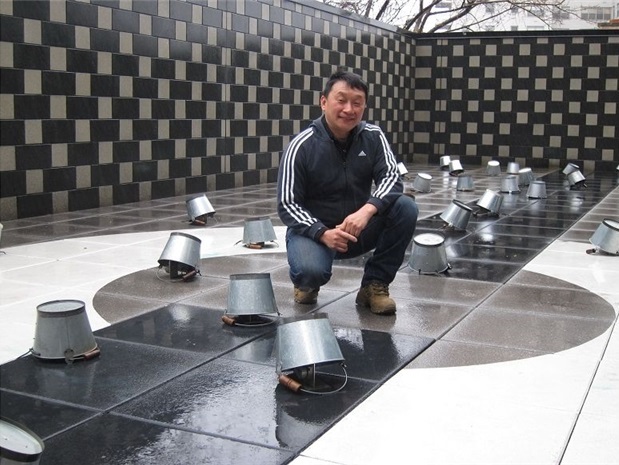 Shyu's 2014 outdoor installation, "One Kind of Behavior," was exhibited at the Bronx Museum of the Arts in New York. 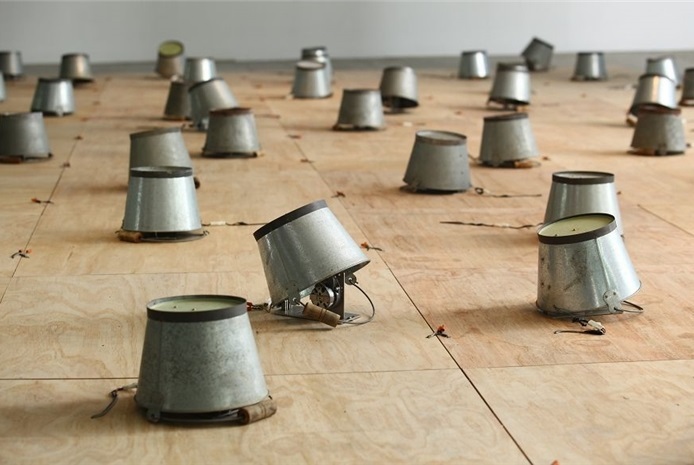 Composed of 80 similarly sized metal buckets placed atop mechanical devices, the piece's individual elements would mindlessly wander around as each bucket clanged against the floor to a different tune. An exploration of the dynamic causal relationship between mankind and the environment, the piece reflected the wondrous ways that species respond to human intervention and the profound impacts this can have on the environment. A specialist with mechanical media, Shyu employs an easy-to-understand artistic vocabulary expressed through complex mechanical principles and devices, transforming cold, hard industrial materials into abstract sculptures that exude warmth in an expression of immense tension and conflict. It is this exploration of the essence and meaning of life through mechanical elements that is the defining essence of Shyu's works. To him, machinery is more than just an extension of human muscle used to accomplish everyday tasks. Through an artistic touch, the precision of mechanical assembly and the rhythm of its repetitive motions can create insight into memory and life. Visitors Today:78. All Time Visitors:1,229,885.